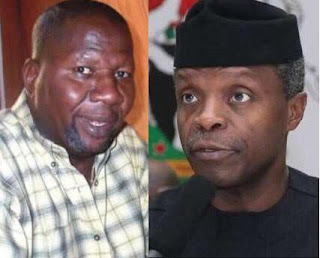 Home Entertainment Politics 2019 ELECTIONS: Vice President, Yemi Osinbajo Comes To The Aid Of Yoruba Actor, Baba Suwe, Donates N1m For His Treatment. 2019 ELECTIONS: Vice President, Yemi Osinbajo Comes To The Aid Of Yoruba Actor, Baba Suwe, Donates N1m For His Treatment. Baba Suwe & Yemi Osinbajo. The Vice President, Prof. Yemi Osinbajo has announced a donation of N1m to the ailing veteran actor, Babatunde Omidina, a.k.a. Baba Suwe, who had solicited for financial support to enable him seek urgent medical attention. Baba Suwe made the plea for financial support on Monday during an interview with popular broadcaster, Kola Olotu, in Ibadan and today, the Vice President, Osinbajo has already responded through his aides who visited the ailing actor at his Ikorodu Lagos home. Meanwhile, Theater Arts and Motions Pictures Producers Association of Nigeria (TAMPAN) also said that the actor has been on the health bill of the association since 2017. The affable comic actor went out of circulation eight years ago, after enjoying patronage and limelight for decades, because of diabetic complications among other ailments. Tracing the origin of his current ordeal, Baba Suwe said the crisis started in the United States of America, where he had traveled to, but collapsed, even amidst cheers by fans. “Since the time I returned to Nigeria, I have been going up and down,” he struggled to tell the radio show host amidst tears. Baba Suwe also linked his current predicament to the ordeals the NDLEA officials subjected him to while in its custody. According to him, the mental, psychological and medical stress he underwent, while NDLEA tried to establish that he indeed ingested cocaine, shattered him. The comedian also lamented that he is yet to receive the N25 million damages initially awarded him. He said: “The most important issue is that I need money to treat and rehabilitate myself as I have spent all I had on the health challenges. Also, Baba Suwe shared his account details: First Bank, Babs Omidina Comedy, 2003537811, during the interview. During an interview with PREMIUM TIMES in September, Baba Suwe revealed that he would release a movie, ‘Oya Gbe Ti’ detailing his 2011 encounter with NDLEA. He was arrested at the Murtala Muhammed Airport in 2011 on the suspicion that he ingested cocaine wraps.